Cut the seitan in morsels. Stir a spoonful of curry with a tablespoon of extra virgin olive oil and season the seitan. Add salt, add lemon juice and marinate, covered and cool for at least an hour, stirring occasionally. Trim the spring onions, wash, slice and put about half on the bottom of the steamer basket. Add seitan and cover with the remaining spring onions, then bake for 15 minutes. Add the yogurt (that before you brought to room temperature) curry remained. Add the chili (without seeds) cut into thin slices. 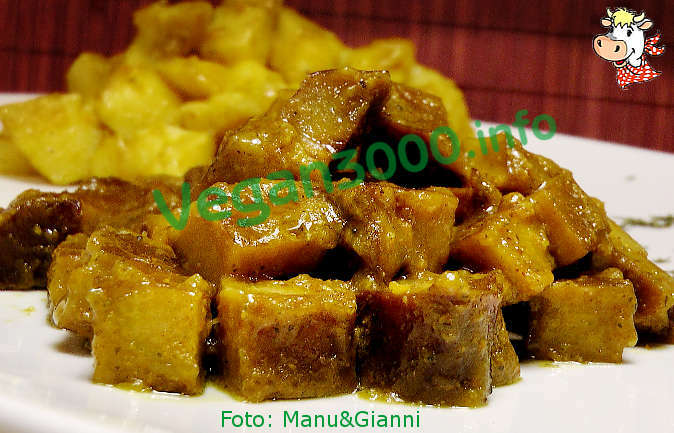 Transfer the seitan on a serving dish preheated, sprinkle with curry yogurt and serve immediately. You can accompany with boiled Basmati rice or with steamed potatoes.